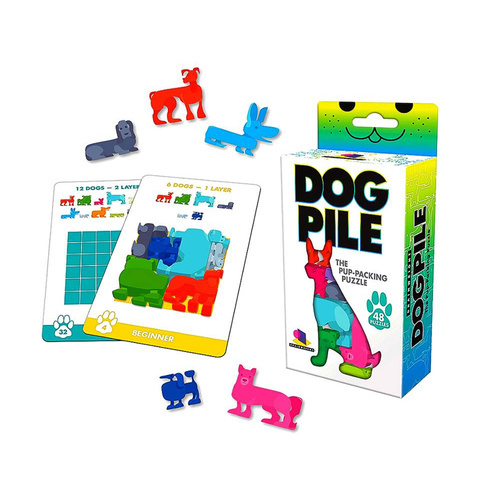 Dog Pile | The pup-packing puzzle! It's time to pile up the pups, dog lover, use some critical thinking to align your pups in a stack! Select a challenge from the pack and arrange all the dogs listed on the card so that they fit perfectly within the grid provided! Your dogs come in all shapes and sizes, so you'll have to figure out how they nestle together to solve each challenge (no hanging dog parts allowed)! So paw your way through all 48 3D puzzles and consider yourself one hot diggity dog. It's ideal for any smarty pants with a soft spot for pooches! Your game contains: 48 challenge cards (with solutions), 12 dogs, 1 travel case and rules of play.